This entry was posted in Celebrate this Week, Literacy and tagged Celebration, community, Elise Gravel, Kate DiCamillo, Katherine Applegate, Marie-Louise Gay, Raina Telgemeier by carriegelson. Bookmark the permalink. Loved reading the meandering–yet always pointed!–conversations with your students about all the books and authors and illustrators they like. Too funny! We’ve been reading some of the Disgusting Critters books at my house this week–Love! Smiled at your little learner creating her own “pass it on” paper. So sweet! 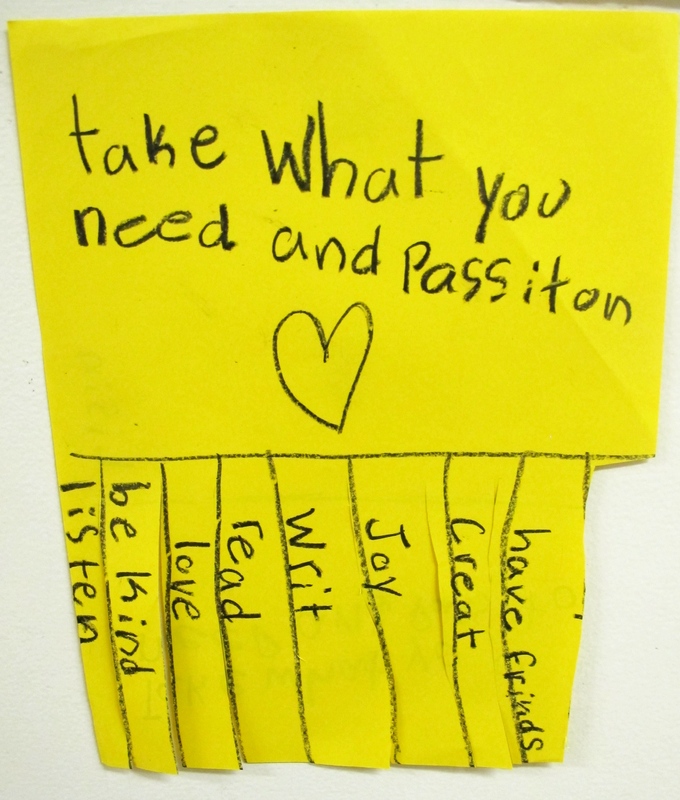 This pass it on paper is adorable. We were touched. Aren’t the Disgusting Critters books the best? Perfect for the age I teach and well, any age. Lots to laugh about. I love how you are passing on so much to your students. It is amazing how much they pass on to us too! How wonderful to hear – they give a lot. Agreed. Great conversations with kids! And, I’m glad there are so many talented writers who are very generous with their time connecting with their readers! And I love the flyers. So positive! We are so lucky that so many authors and illustrators are so generous. 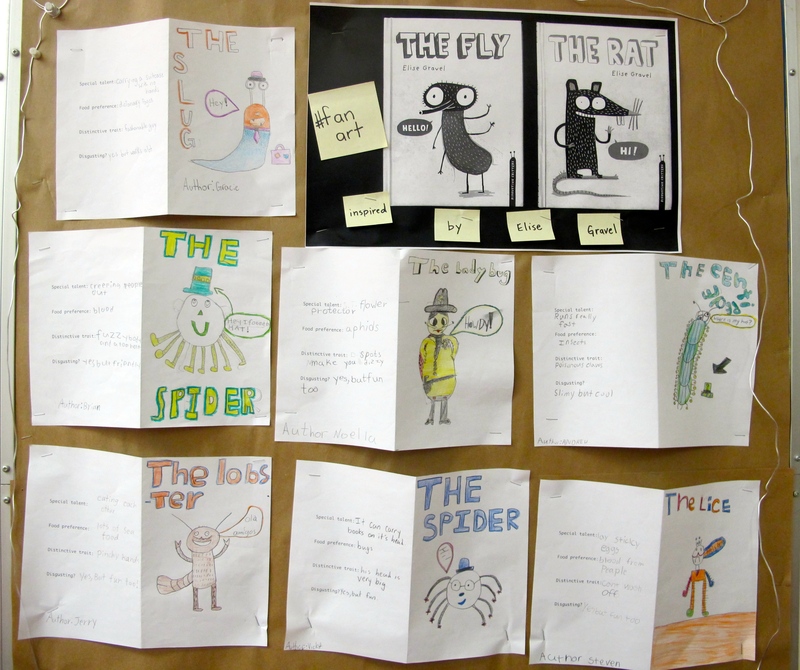 My students are so excited to share their work and letters with Elise Gravel. But, if truth be told, I might be most excited. Love the conversation. Love the student’s pass-it-on flyer. Love the joy in your post. Celebrating together with you. Thank you Terje! It is pretty amazing to get to have all of these great conversations about books and writers/illustrators with my students. There is much awesome in my room. I witness it daily and am always entertained! I love your class too! Thanks for sharing your students and their thoughts with us. They brought smiles to my face. So happy you love them too. These kids . . . The student pass it on chart is amazing. I love that you were gifting these words to each other with messages. Be sure to tell your students that there’s something really special about receiving “real mail.” I hope we don’t lose the art of letter writing. A friend commented (on FB) about finding a letter that I wrote in 1977 to her. You are so right. “Real” mail is very special. It is so exciting to be sending this big package of letters and art to Elise Gravel! I love the way you captured your celebration through conversation. 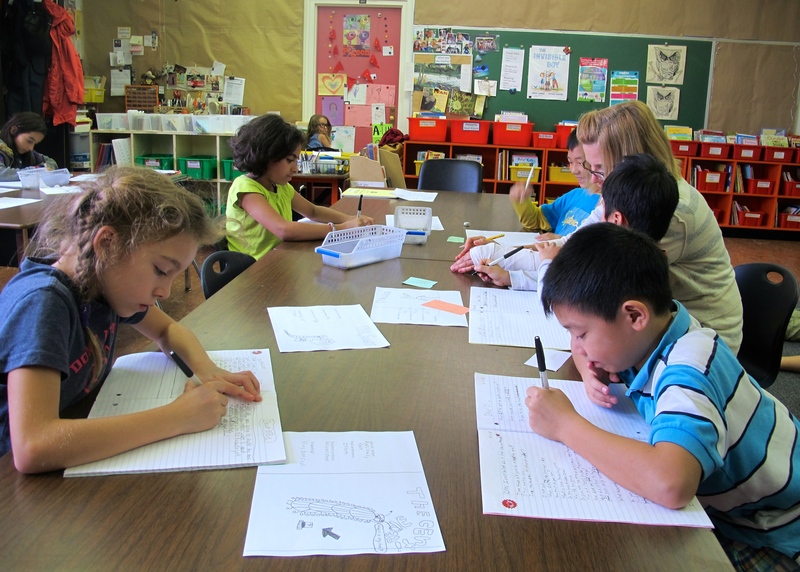 Your students see themselves and YOU as part of the community of writers and readers. Thanks for faithfully celebrating. Thank you Ruth. This celebration is so much a part of my week – I can’t imagine not doing it. 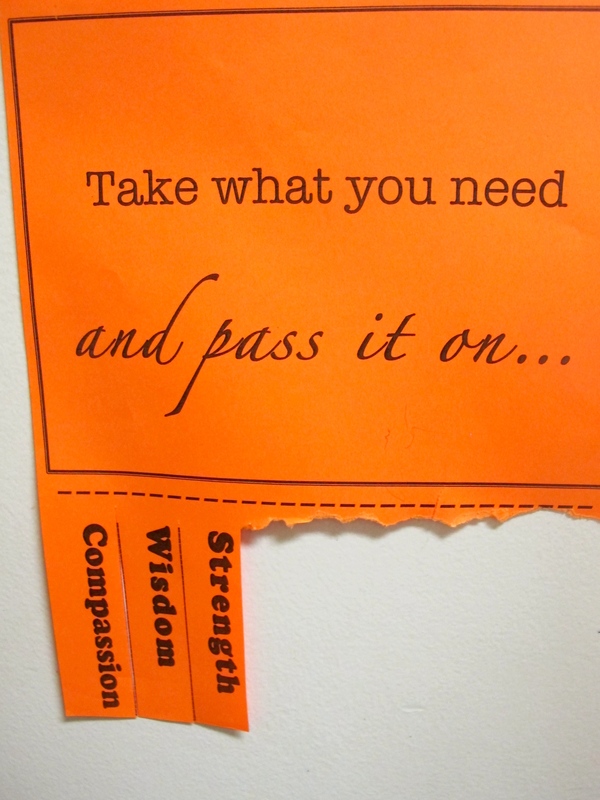 Pass it on papers – what a wonderful idea! Love this! Also love the “listening in” on author talk! So great! 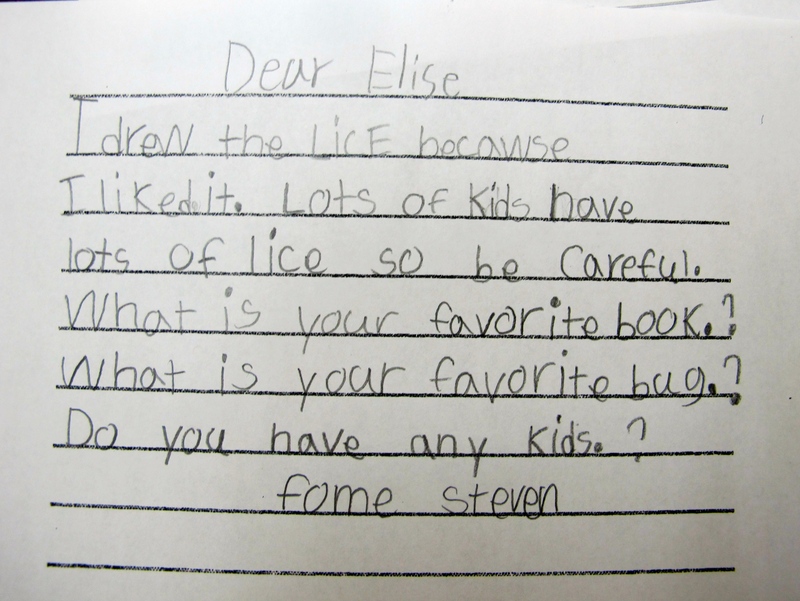 Elise Gravel – LOVE her books and so do my students! 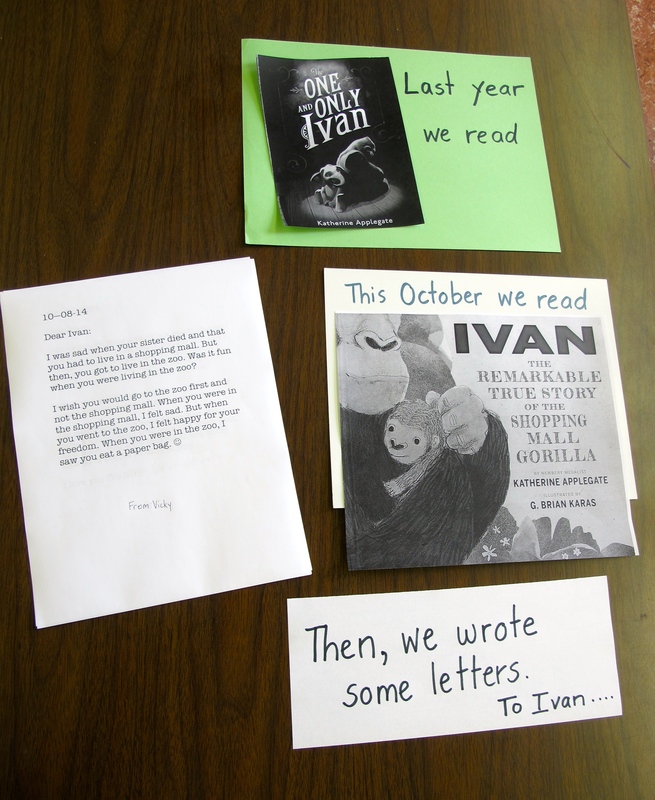 Ivan letters were tender and heartfelt. This is such a great glimpse into your wonderful classroom – thank you! Many thank yous. Elise Gravel captures the interest and humour of the kids, absolutely. My students were so delighted to send her “fan art” And those Ivan letters, sigh . . . This is so beautiful it brought tears to my eyes. Your posts are always a gift to me. Thank you for using your life so well. Wow, what a beautiful comment. Thank you!